It had been thousands of miles since crossed any open water, until we encountered the Neuse River and Pamlico Sound on this most recent leg. The forecast was for 2-3 foot waves and moderate winds out of the northeast leaving Morehead City, NC, so we put away the TV and computers and didn’t think much more about it. 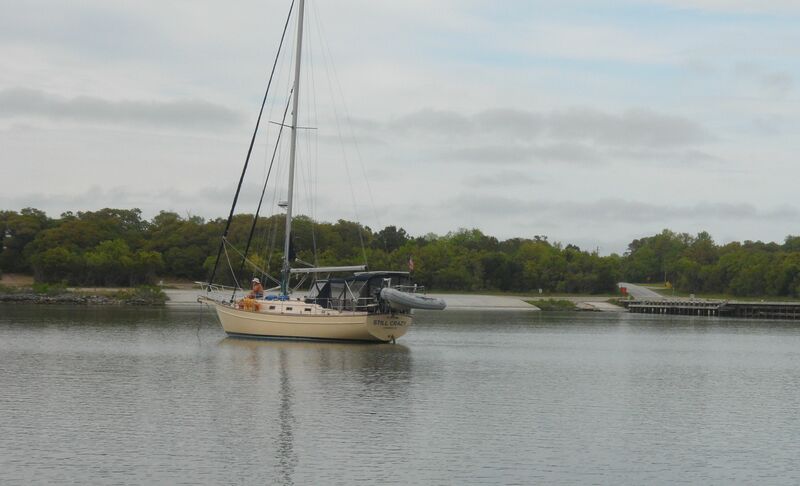 So naturally we put our nose out into the Neuse River going across to Oriental and got totally hammered with 25 knots of breeze and square waves coming from every direction. So once again cat, bedding and the contents of a drawer whose catch broke ended up on the floor. The dockmaster said what happens is that in Northeast winds the waves blow 100 miles into a piece of water only 3 miles wide and 11 feet deep and simply start bouncing off the bottom and sides of the river. It has been blowing like that now for three days, so we are pretty much stuck in Oriental. The water is all piling up on one end of town and the roads around the Marina turn to rivers at high tide. Hope to get out tomorrow, but we are going to be very careful. Oriental is called the Sailing Capital of North Carolina and has some big marinas, so I thought it was a pretty substantial town. But it’s basically just a place where a lot of people from Charlotte and Raleigh keep their boats, so while a nice village, about all it amounts to is six churches, six restaurants and the hardware store. Worked our way up from Southport via Hammock Bay at Camp Lejeune, where the guidebook says the Marines launch all their amphibious vehicles for practice. We heard a lot of cannon fire, but didn’t get to see any practice invasions. 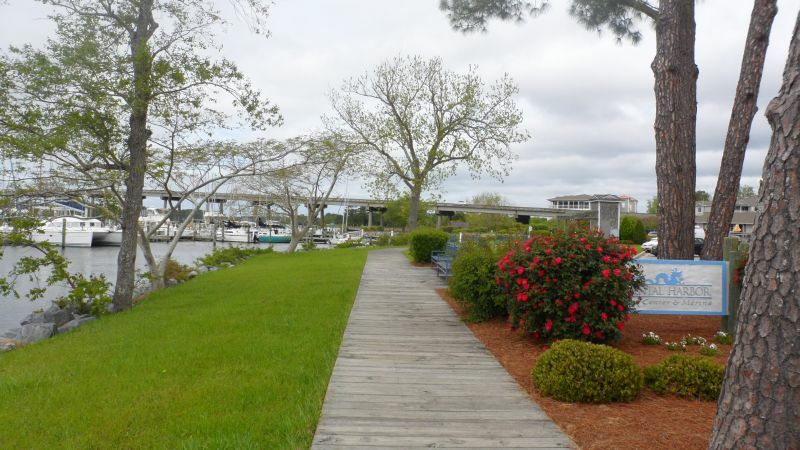 Then onto Morehead City/Beaufort. Frankly, between the two Beauforts, SC and NC, I think the South Carolina version wins in terms of beauty, interest and food. 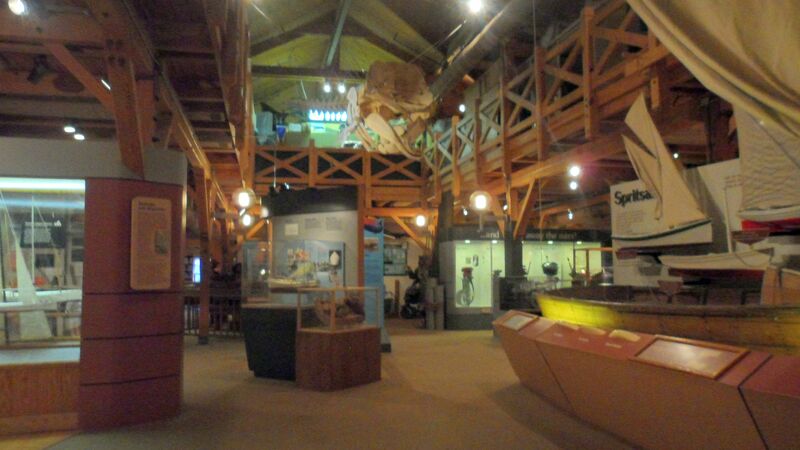 Although the North Carolina Maritime Museum in Beaufort is a very good with an extensive small craft selection. It took a number of plaintive “Dad can we go nows?” to break me out of there. 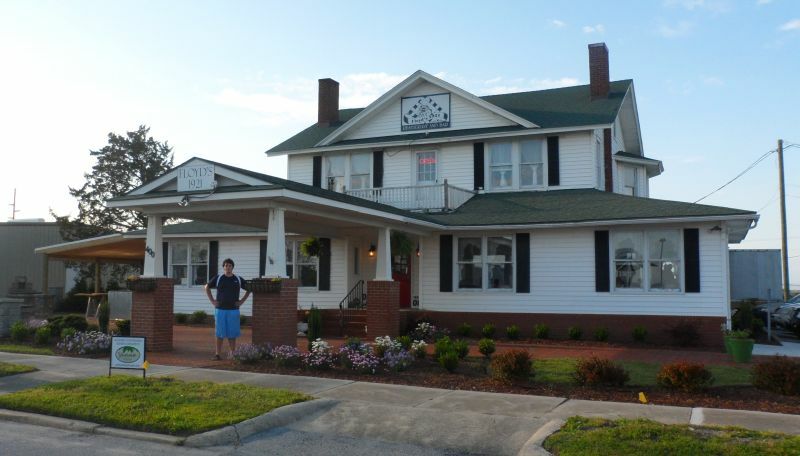 While in Morehead City, we ate at a great Southern restaurant, Floyds 1921. Compared to the interminable fried catfish in Alabama and Mississippi the food in this stretch has been wonderful — shrimp, crab, local fish, quail, game, fresh greens, and plenty of “polenta” (grits). We started with a crab appetizer and John had a local wild mushroom goulash. I had a fancy meatloaf with a wild mushroom gravy over cheese grits with a green vegetable I couldn’t quite identify, which may have been the tops of ramps in a warm balsamic vinaigrette. Coffee shop near the marina. Fish were swimming in the street. Waterfront Park, Oriental. We are really chasing Spring up the coast now. Hammock Bay — not a grunt in sight. 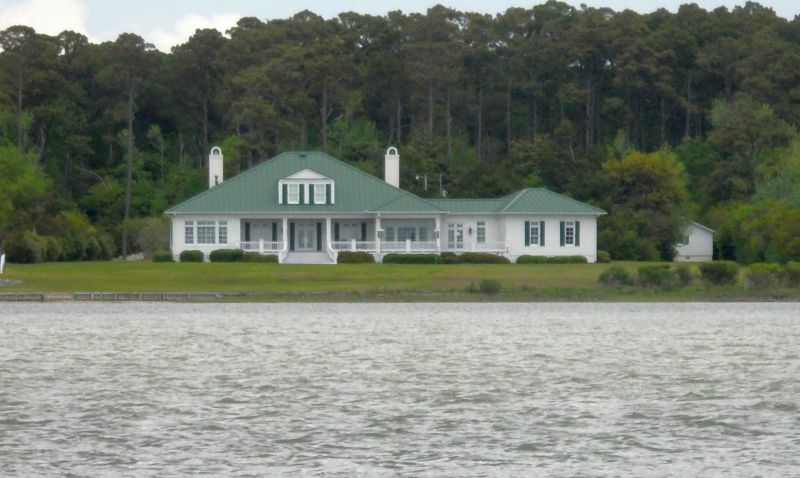 Character of the houses along the ICW has changed completely once again. I sure like this one. 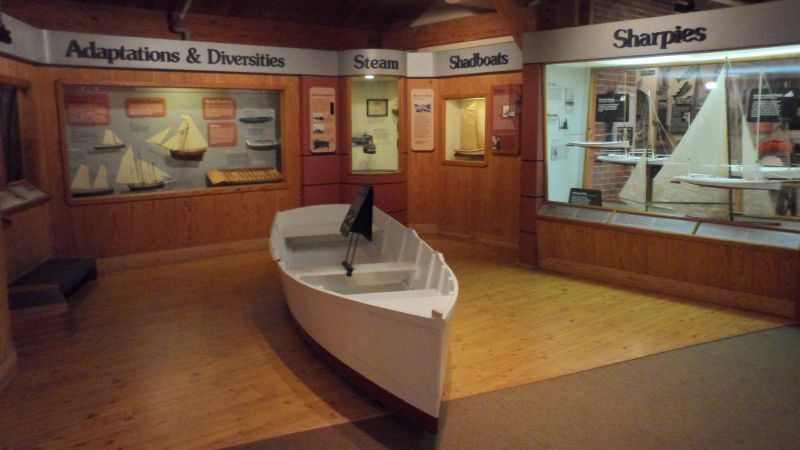 To a wooden boatbuilder, exhibits like this are addictive. 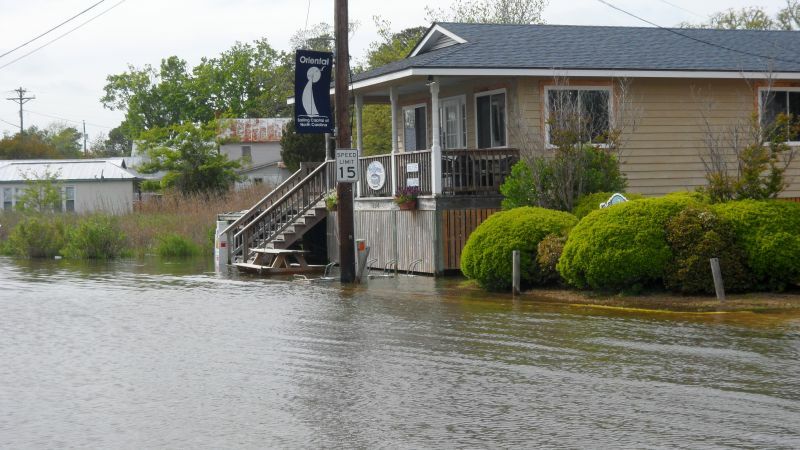 Floyds 1921 Restaurant Morehead City. Worth a side trip. 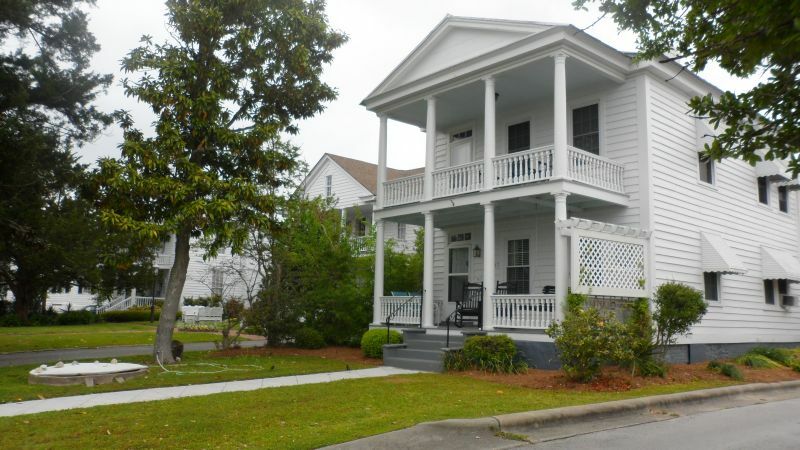 Beaufort, NC, Victorian. 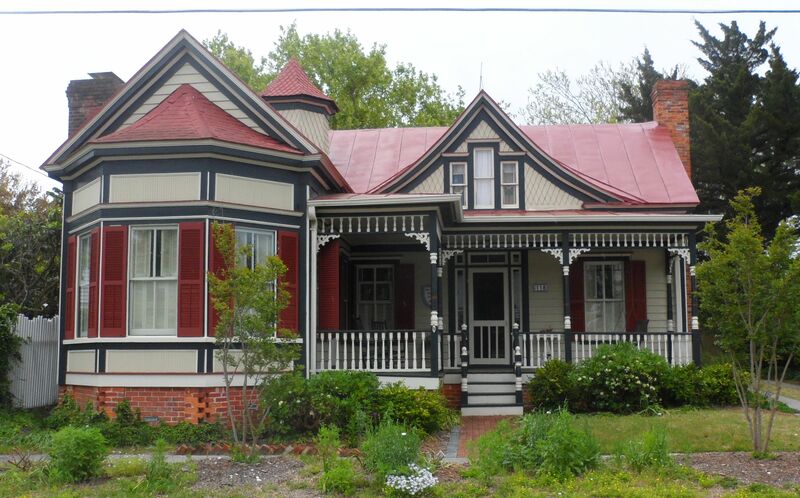 Surprising number of Victorians all over the South built during the lumber boom. Lots of square two-deckers in Beaufort, NC. I have taken a poll of all the boats in Elizabeth City and not one has ever seen the Nice Neuse. On the way here we also got to see the Pewky Pamlico snd Punky Pungo, but to today the Adorable Albemarle.